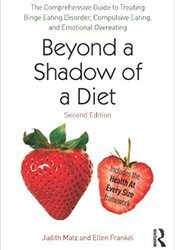 Beyond a Shadow of a Diet is the most comprehensive book available for professionals working with clients who struggle with Binge Eating Disorder, Compulsive Eating or Emotional Overeating. The authors present research revealing that food restrictions in the pursuit of weight loss actually trigger and sustain overeating. Next, they offer step-by-step guidelines to help clients end the diet mentality and learn an internally-based approach known as attuned eating. Divided into three sections-The Problem, The Treatment and The Solution-this engaging book contains chapters filled with compelling case examples, visualizations and other exercises so that therapists can deepen their knowledge and skills as they help clients gain freedom from preoccupation with food and weight. In addition to addressing the symptoms, dynamics and treatment of eating problems, Beyond a Shadow of a Diet presents a holistic framework that goes well beyond the clinical setting. This invaluable resource includes topics such as the clinician’s own attitudes toward dieting and weight; cultural, ethical and social justice issues; the neuroscience of mindfulness; weight stigma; and promoting wellness for children of all sizes. Drawing from the Health At Every Size paradigm-and the wealth of research examining the relationship between dieting, weight and health-Beyond a Shadow of a Diet offers both therapists and their clients a positive, evidence-based model to making peace with food, their bodies and themselves. Judith Matz, L.C.S.W., the director of the Chicago Center for Overcoming Overeating, specializes in the treatment of eating and weight issues. She's the coauthor of Beyond a Shadow of a Diet: The Therapist's Guide to Treating Compulsive Eating and The Diet Survivor's Handbook: 60 Lessons in Eating, Acceptance and Self-Care. Ellen Frankel, LCSW, worked in the field of eating disorder treatment and prevention for over fifteen years. She has been interviewed on topics related to eating issues, body image, and spirituality by national newspapers, traditional and online magazines, as well as national radio programs across the country, and has appeared on local and national television including NBC's Today Show, CBS's Early Show, CNN's Paula Zahn Show, Fox News' Your World with Neil Cavuto and The Dr. Phil Show. Ellen is a dynamic presenter focusing on topics related to eating issues, body image, and spirituality, with a particular focus on ways in which the East and West intersect. In addition to co-authoring Revolution of Jewish Spirit: How to Revive Ruakh in Your Spiritual Live, Transform Your Synagogue & Inspire Your Jewish Community (Jewish Lights Publishing 2012), Ellen is the author of the novel Syd Arthur (Pearlsong Press 2011), and Beyond Measure: A Memoir About Short Stature and Inner Growth (Pearlsong Press 2006) as well as the co-author of The Diet Survivor's Handbook: 60 Lessons in Eating, Acceptance and Self-Care (Sourcebooks 2006) and Beyond A Shadow of a Diet: The Therapist's Guide to Treating Compulsive Eating (Brunner-Routledge 2004). She has also published in professional journals and has been featured in local newspapers including The Boston Globe, The Jewish Journal North of Boston and The Jewish Advocate.